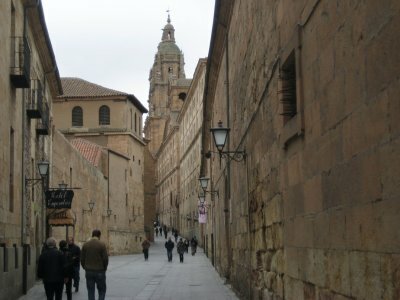 Walking tour of Salamanca, Spain, UNESCO World Heritage Site... There seems to be a lot of those around. 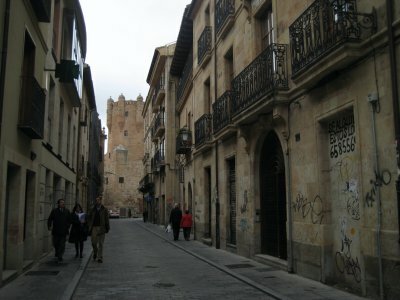 After a late night arrival in Salamanca, the next day I was off to explore. 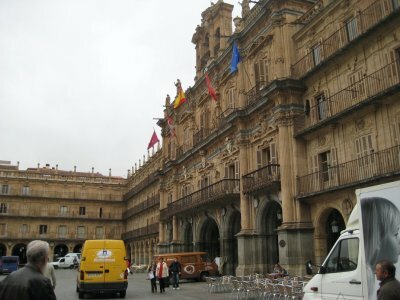 Salamanca has a very long history, and much of the old town has been well preserved. 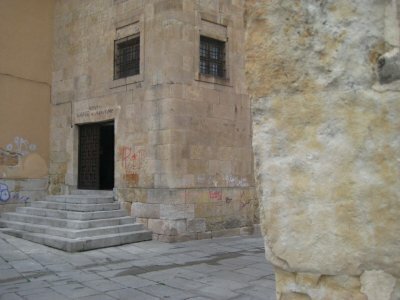 UNESCO made the old city a world heritage site in 1988. 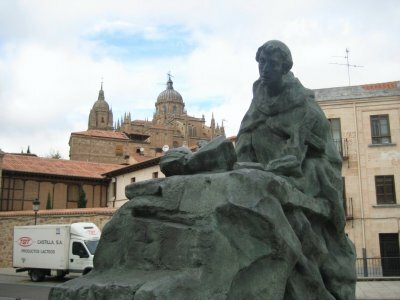 The town is probably most famous for its University which was founded in the 12th century. 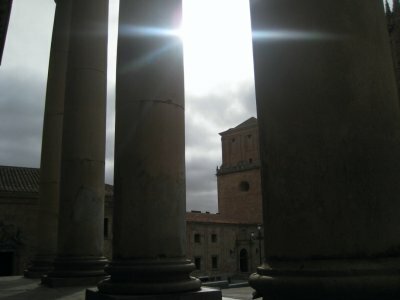 I did a rough circle of the city on my one day there, hitting all the highlights on my tourist map of the city, plus whatever I saw along the way. It was a nice day, very sunny but a touch windy. 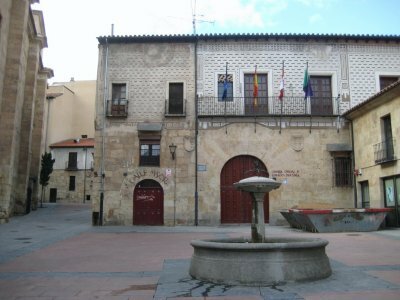 The town is centred around Plaza Mayor (Main Square). 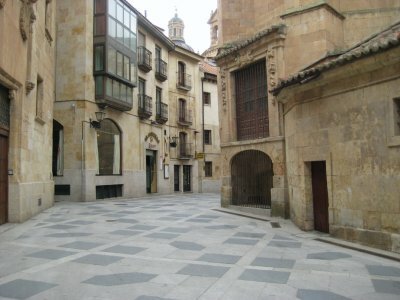 The buildings surround the square are Baroque dating from 1729 to 1755. 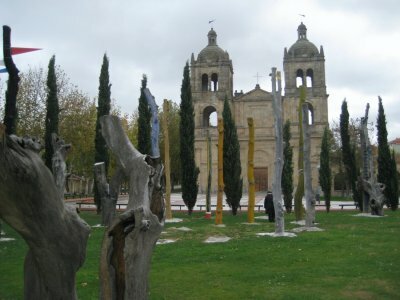 The plaza was designed by the architect Alberto de Churriguera and finished by Andres Garcia de Quinones. 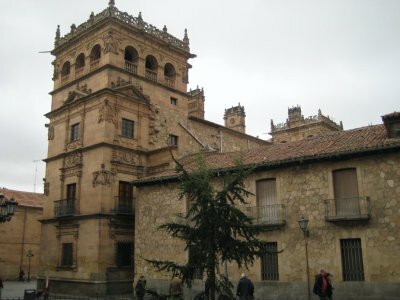 Off to the east of the Plaza Mayor is Santa Clara Convent. 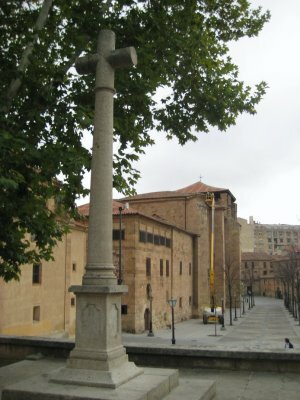 No longer a convent, the building now hosts a museum with murals and paintings from the 13th to 16th centuries. 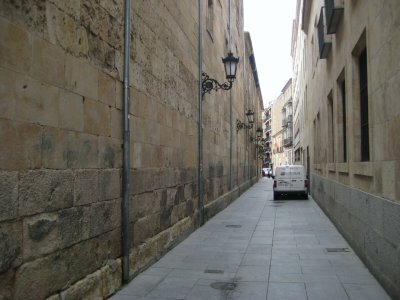 Streets here are narrow and short and twisty, suddenly bursting out into open squares and park spaces, like a good medieval city should be. 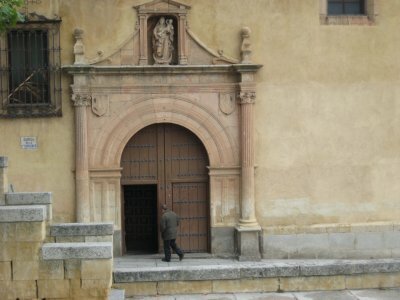 Heading north from the Plaza Mayor, I eventually reached the Plaza de San Marcos and the Iglesia de San Macros, a small, round, Romanesque church at the Zamora gate to the city. 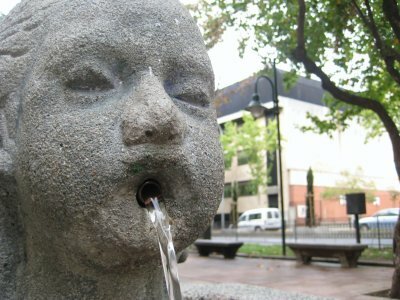 Next I headed down the Paseo de Carmelitas, a wide boulevard with lots of green space with walking paths, trees, fountains and sculpture. 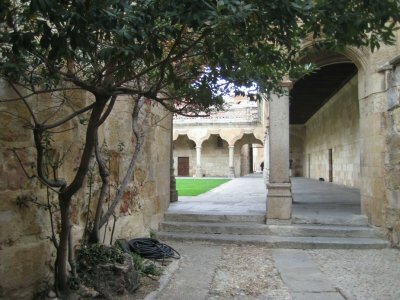 I cut in about halfway down the street at Campo de San Francisco, a green space that has the Vera Cruz church, Ursulas Convent and Monastery and the Palace of Monterrey bordering it. 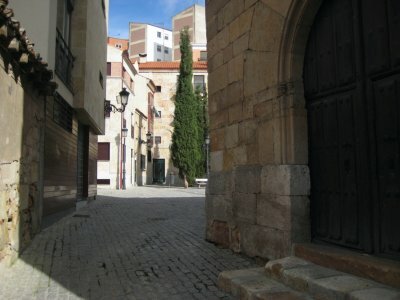 From there, the tourist trail took me down Compania, a street jammed back with interesting sites. 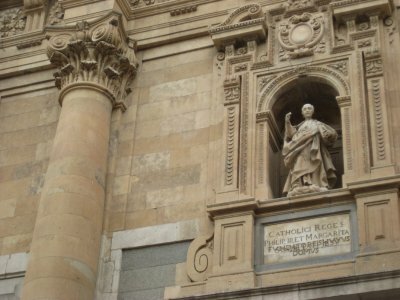 The Romanesque San Benito church is along the Compania right before you get to the imposing Universidad Pontificia. 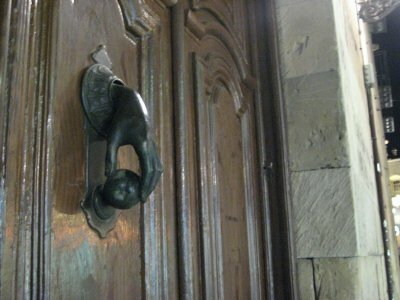 Established in 1104. 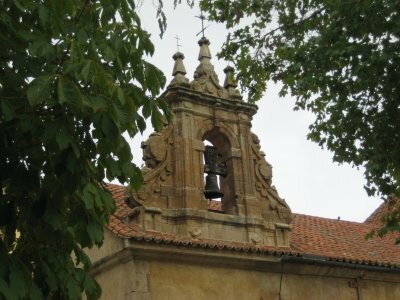 During the middle ages the Benedictines who worshiped at this church battled for control of the city government with the worshippers of Saint Tome. 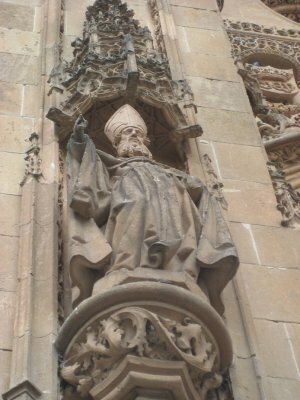 Saint John of Sahagun mediated between the two groups, bringing peace to the city and in turn becoming patron saint of Salamanca. 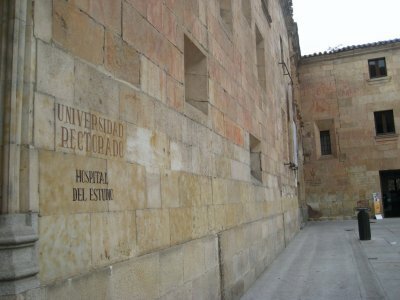 The Pontifical University of Salamanca, or in Spanish the Universidad Pontificia de Salamanca and known as the UPSA was founded in the 13th century as part of the main Salamanca University. 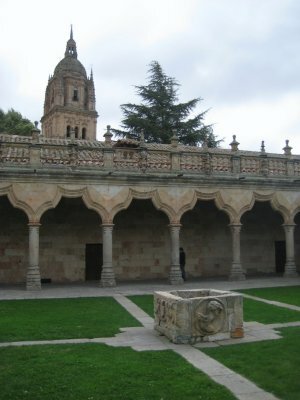 The Spanish government dissolved of the University of Salamanca's faculties of Theology and Canon Law in 1854, closing the university. 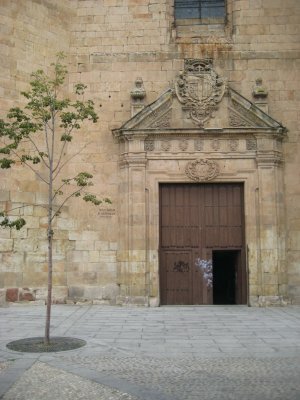 It was reopened in the 1940s. 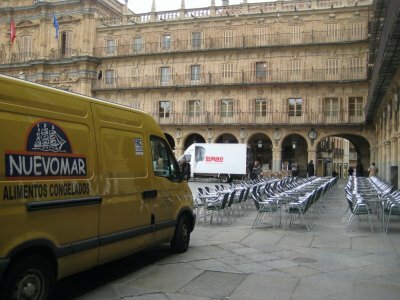 After crossing the Plaza San Isidro, you enter the main campus of the University of Salamanca. 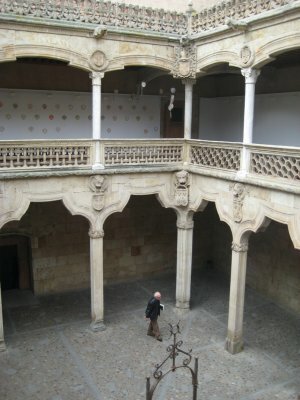 After almost eight centuries in operation, the university of Salamanca is still going strong. 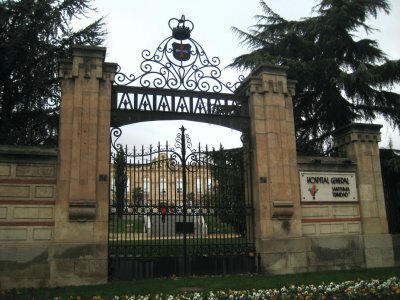 In addition to a number of students from Spain, the university is a favourite of foreign students, especially those looking to study Spanish, and has over 2000 foreign students. 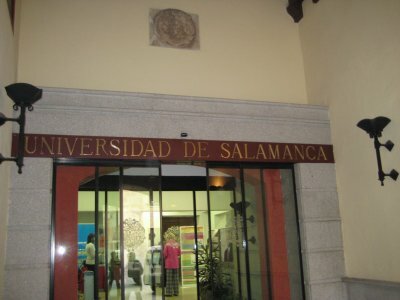 Whether Salamanca is 1st, 8th, 9th, or 20th on the list of oldest continually operating universities, dating back 800 years makes it pretty old in anybody’s book, I would think. Rectorado? Damn near killedorado! Hmm, that joke seems to work a lot better in English. 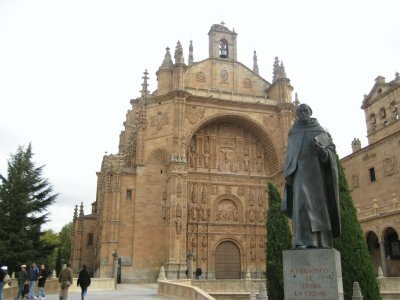 Sitting just a block away from the university is the twin cathedrals of Salamanca. 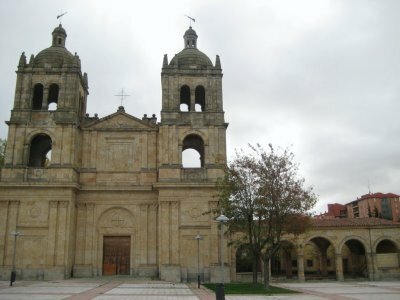 The original cathedral was built in the 12th century, and is a Romanesque medieval cathedral. 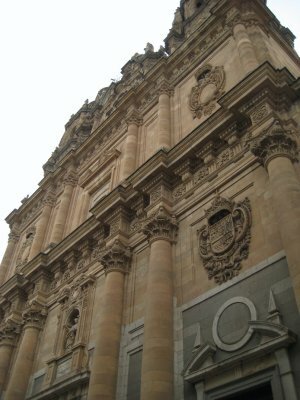 A new cathedral was built, co-joined to the older cathedral in spurts and fits from the 16th to the 18th century, picking up elements of Baroque, Renaissance classicalism and Gothic architectural along the way. 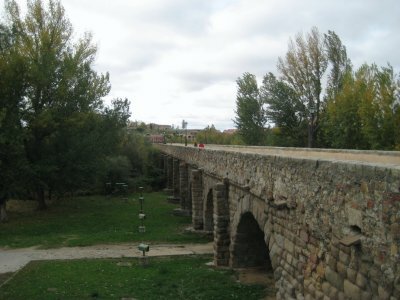 South of the Cathedral is the Tormes river, across which an old Roman bridge dating back to the first century spans. It’s been updated along the way. 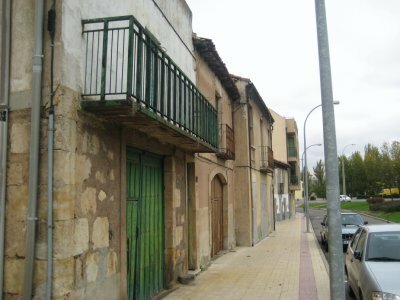 The other side of the bridge is the south side of the river known as Arrabal. The area seemed nice, if a touch quiet (excluding the traffic streaming along the main roads). 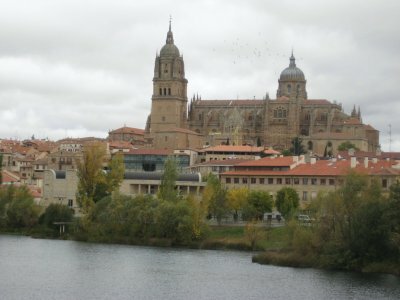 Climbing up in the park gives a nice view of the old part of Salamanca across the river. I love that. “some of the attractive places we can admire inside.” Can we? I looked around to see who the "we" was, but it was just me. 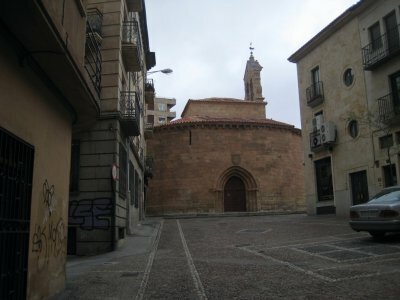 Just up the street is the 15th century Torre del Clavero. 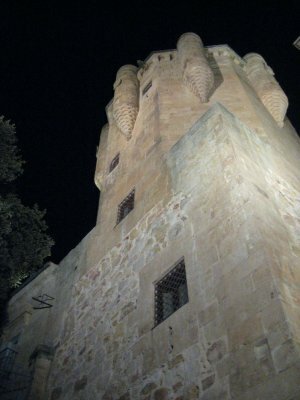 The tower is all that remains of a mansion built by Francisco de Sotomayor. 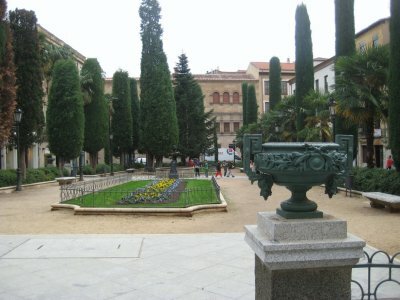 I then did a trip through the nearby Parque Huerta de los Jesuitas, which is a pleasant green space to the east of the old city. 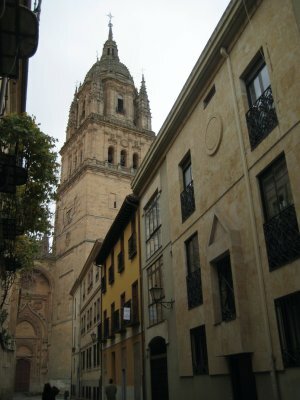 I had done a lot of walking, though, and was getting tired, so I returned to my hotel to rest up. 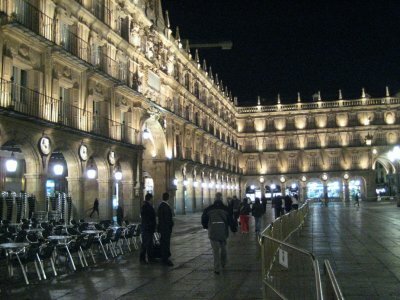 I had dinner at a nice little restaurant just off the Plaza Mayor. It was tapas, so I had three plates of items instead one big plate. I must admit dinner was a kind of solemn affair. I like good food, but when travelling alone I usually just grab a quick and cheap bite. Its not that I don’t want to splash out on a nice meal, its just that I feel both self-conscious and bored sitting in a restaurant by myself for an hour eating a nice meal. I wonder what other solo travellers do about meals? After that, I looked for a place to grab a pint. Of course, I wound up in an Irish pub. Irish pubs are everywhere. I drank in an Irish pub in Ulaan Bator, Mongolia. This one was different than most Irish pubs in that it had mixed Irish pub and pirate theme. The typical Irish paraphernalia like Guiness advertisements, bookcases and stained-glass windows separating booths was joined up with cannons, guns, parrots and boxes of treasure. I am not sure why the meshed those two together. 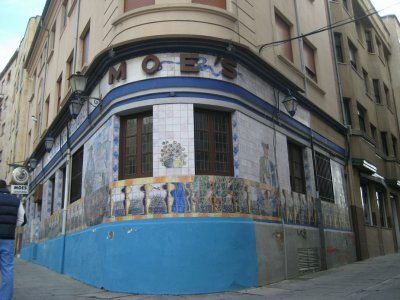 The bar was mostly filled with locals watching a couple Spanish football league matches. 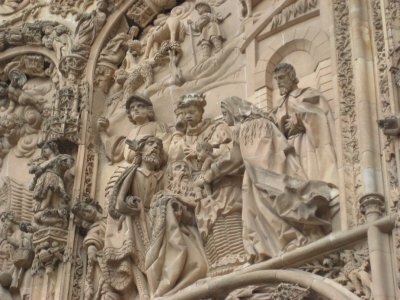 I noticed that the Spanish people don’t seem to take any breaks between words. Itsoundsliketheyjustsayanentiresentenceasasinglewordwithmanysyllables. I wonder how they breathe? Mmmm, tarta de suelo... D'oh! 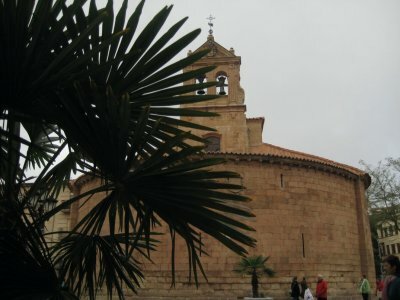 The next day, I checked out and bid "¡Adios!" 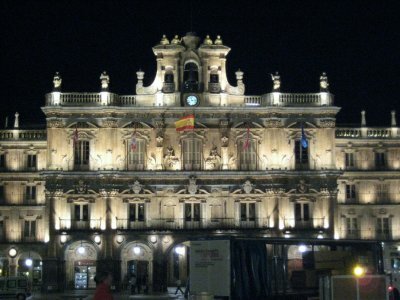 to Salamanca and boarded a train to Madrid. 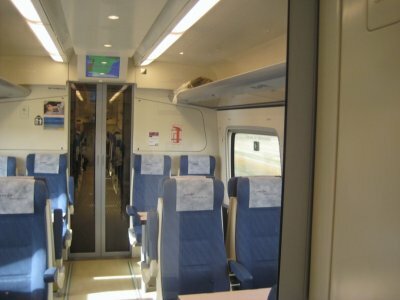 The train was interesting, a small train of just 3 coaches, the interior of the cars were were white plastic, with blue fabric seats. It reminds me of a hospital from Sci-fi movies, but moving. Perhaps its design is based on a “hospital ship” from Star Wars or Aliens? 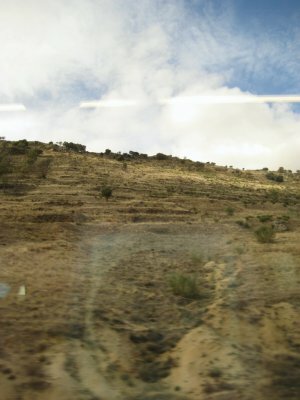 As the train runs from Salamanca to Madrid, both situated on the central plains of Spain, we passed an number of rocky hills covered with sparse forests. 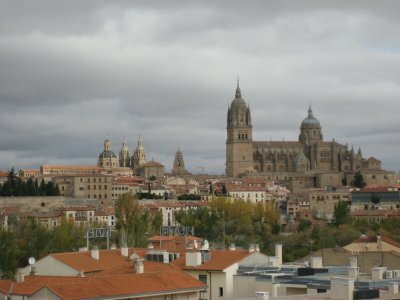 It reminded me a lot of the novel “For Whom the Bell Tolls,” which probably speaks well about Hemmingway’s ability to describe landscapes as the novel does take place in the hills around Madrid. I sat back and watched the rocky, dry scenery pass by, waiting for the next part of the trip. 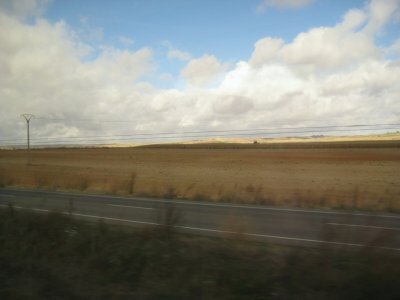 Despite what they might have taught you in My Fair Lady, the central plains of Spain are quite dry. 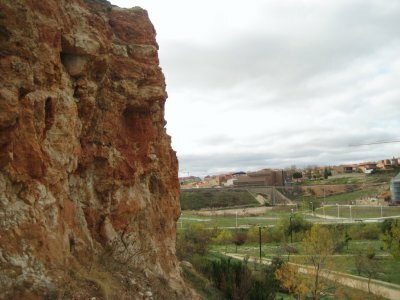 Soon the rocky hills, patches of forest and endless plains gave way to low rise buildings, highways and office parks. The exterior of all cities now, almost indistinguishable from any other city. 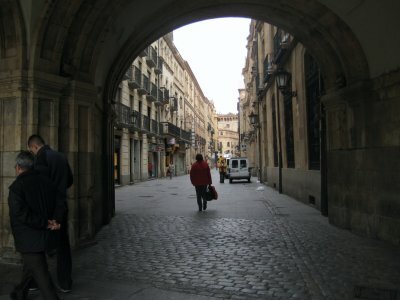 This specific city, though, was Madrid.